Welcome to the world's tallest Holiday Inn! 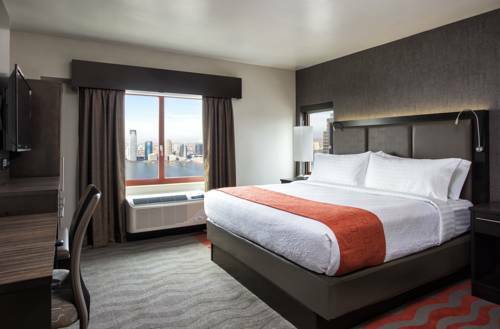 Discover elegant luxury and beautiful city views when you stay at the Holiday Inn Manhattan Financial District. Centered in the heart of New York City, our hotel is located in the Manhattan Financial District near the 9/11 Memorial Museum in Lower Manhattan. Business travelers and guests will enjoy quick convenience to the Wall Street and New York Stock Exchange and tourists attractions like the Statue of Liberty and Battery Park. Our Manhattan hotel features 50 floors and 492 rooms. Relax in The City that Never Sleeps in our magnificently appointed guest rooms, with luxurious bedding, an in-room coffeemaker and flat-screen TV. Guests can also utilize our state-of-the-art Business Center and your very own in-room desk and high-speed Wi-Fi. Experience fine dining in St. Georges Restaurant, where Kids Eat Free and the cuisine is sure to delight even the most discerning palate. Holiday Inn Manhattan Financial District is the newest addition in the Big Apple. We are proud to be the tallest Holiday Inn hotel in the world and we are sure that your stay with us will be a memorable one. Irish Pub serving authentic Irish foods and American bar foods. Our beverage menu compliments the meal menu and offers exceptional beer, wine and spirits. There 16 beers on tap. The iconic department store offers clothing for men, women and children. Quality designer brands at low costs. Originally known as the World Financial Center, Brookfield Place is a complex of office buildings and shops located just across the street from the World Trade Center and less than half a mile from Holiday Inn Manhattan - Financial District.